The endless rain of this summer has not encouraged Mario to come out of the garage, it’s not that he worries about getting wet but the weather just doesn’t lend itself to the normal summer activities of trips to the seaside and lazy picnics both of which Mario is perfect for. In fact Mario has gone to stay in a friends garage for a few days to create some needed workshop space, not sure if he was particularly keen on this as for the first time in a long while he’s a little sick – nothing to worry about just a seal let go and let the water out, hopefully all will be put right at the weekend, you never know it might stop raining and we can have a little drive. 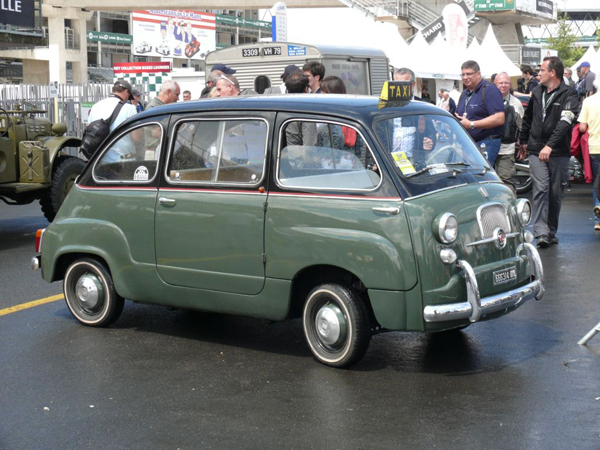 Firstly a Multipla (pic by Christopher Wigdol) in Rome Taxi colours, although we can’t see the registration this is the car which we saw at the Revival last year, you can still see the paddock pass in the windscreen. We thought it was a team support car at Goodwood so maybe the owners were racing here too. And here’s a couple taken by Steve Flynn. Mario has an older brother ‘Regie’, a Renault 4cv so he was quite excited to these these two. 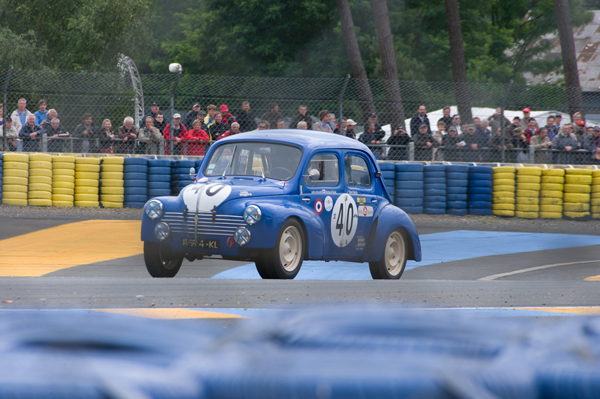 One was competing in the Classic Le Mans, of course in the 50’s Renault competed in the full 24 hour race with both factory and special body 4cv’s and won their class. 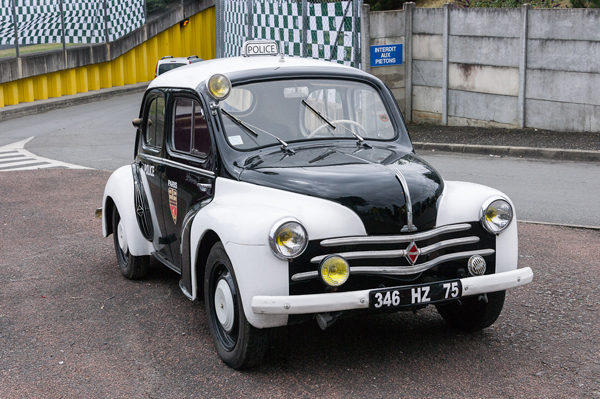 The other picture shows a 4cv in Paris Police livery, this is a replica because (anorak on) the original police cars had the front doors cut down so it was possible to fire a gun easily! 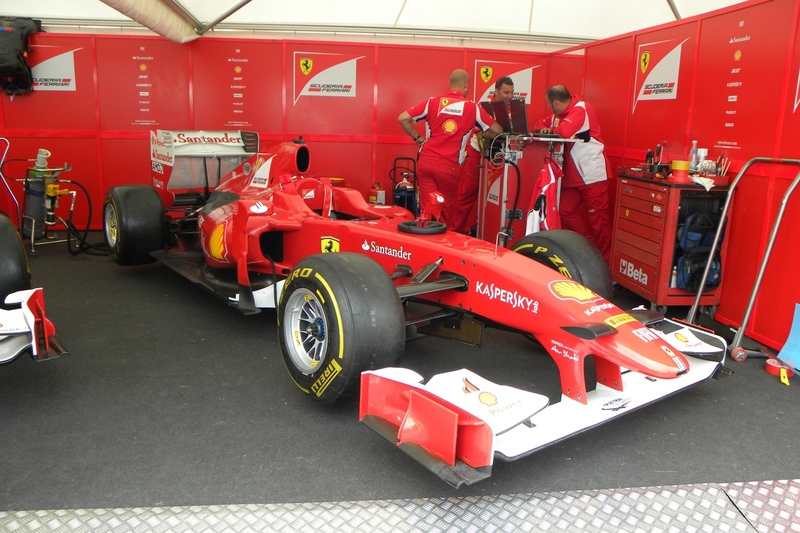 Last weekend was the popular Goodwood Festival of Speed. Unfortunately we don’t get to help out at this event so poor Mario got left at home while his humans went off and enjoyed themselves. This is a report on the ‘little’ things we saw at the event. There were no Multiplas at the show and in fact Fiat was very poorly represented, they were one of the few manufacturers not to have a modern car stand at the event. 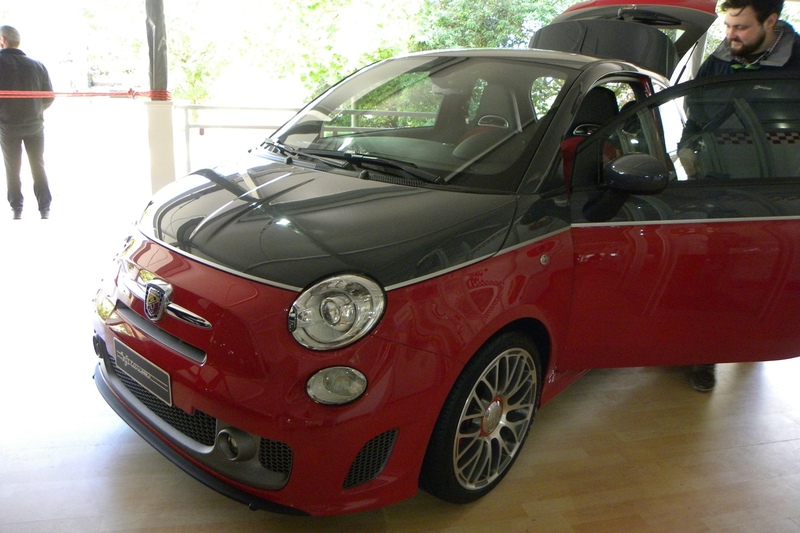 Abarth had a stand at the moving Motorshow with some lovely versions of the Fiat 500, a Grand Tourismo looking very stylish in dark grey and red and a convertible. I wonder how well Mario would go with an Abarth spec engine? In the F1 paddock we spotted this rather lovely ‘Ferrari Red’ original Fiat 500, we guess it was owned by somebody In the F1 team, we dropped one of Marios cards in the window so maybe they will read this and become friends! 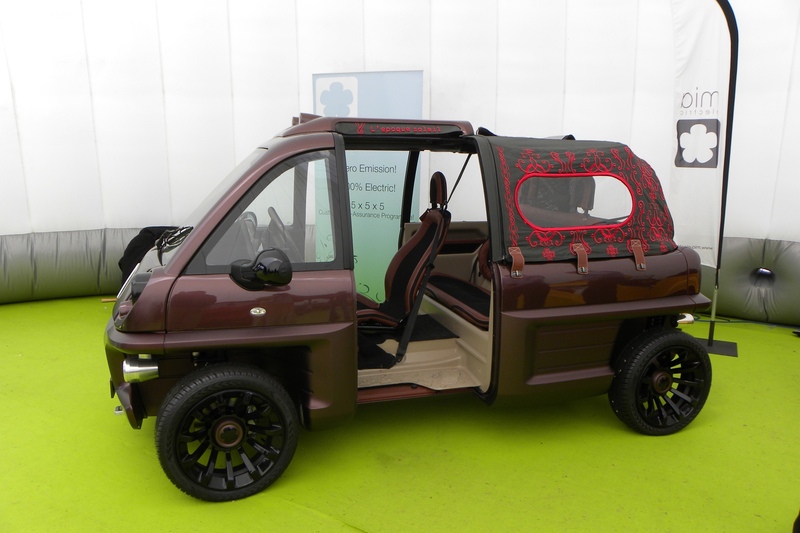 Green vehicles are big news at the FoS, we spotted this rather cute ‘beach car’ in the Tech Pavilion. Made by Mia Electrics the newly launched Mia Rox can be customised to your personal style and usage. With bags of character and a really cool embroidered hood this electric car looked great fun but for it’s size still only carried a driver and one or two small passengers. 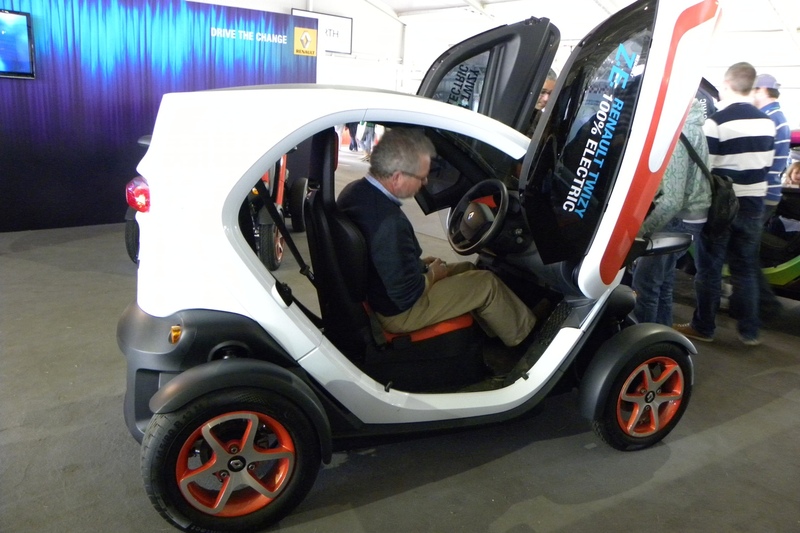 Renault had their Twizy on display at the Moving Motorshow, this rather fun electric car is in production but at a cost of over £6000 and a monthly rental of the batteries is rather expensive. It has a range of around 60 miles and can be charged from a normal household plug, again it could only carry the driver and a very squashed passenger. 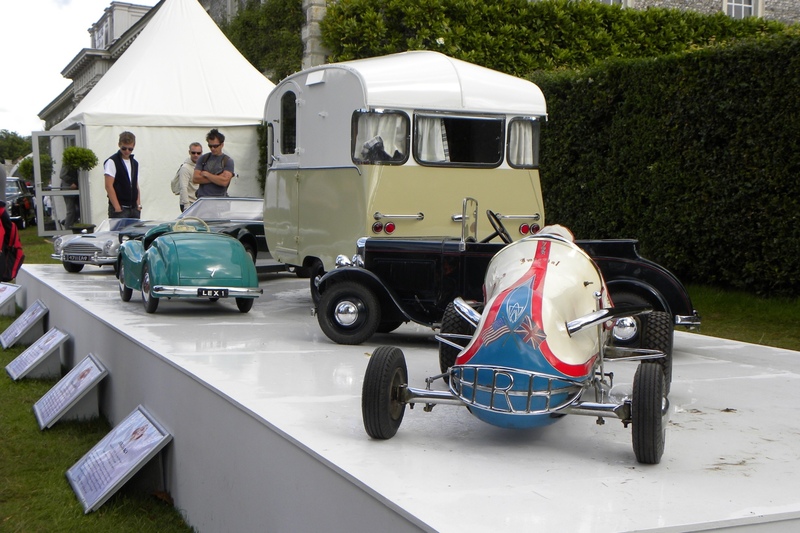 This year the Cartier ‘Style et Luxe’ concours featured Royal cars in honour of the Queens Diamond Jubilee, amongst the impressive entries was a collection of toy cars and this wonderful Caravan belonging to Princess Ann, it would look great being towed behind Mario. Finally, this years centrepiece was a brilliant sculpture celebrating Lotus, it looked really impressive and different every time you looked at it in the changing light, mind you it would have been even more fabulous covered in Fiat Multiplas!